Alice is hosting a marvelous dinner with her friends tonight. She has invited everyone to come over and enjoy a night of fun, games, and dinner. But, when Alice opened her recipe book to start preparing the meal, she realized that she was missing all of her ingredients! Take a trip to the supermarket with Alice and help her get everything in time for the meal. 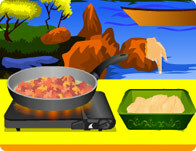 Watch the timer, and hover over the arrows on the back and forth to show Alice where the ingredients are. Get all of the ingredients at the top of the screen and make sure you pay the cashier the right amount before the time runs out! Use the mouse to hover over the arrows on the left and right to move Alice, and click on an ingredient to add it to the cart.